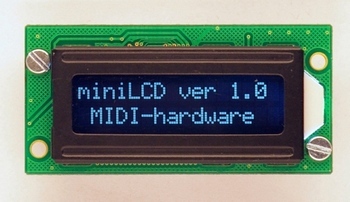 This new smaller LCD module is capable of displaying text messages passed from Hauptwerk (you need MRG2 in version at least 2.4, or MIDI128 4.0 as a master controller). Apart from that this device is great help in user settings and MIDI troubleshooting, and after all, it looks good to have a display on any equipment. The display is smaller than typical size 2x16 LCD, but the visibility and contrast are excellent. It connects to any of the master controllers as typical scanner, and has daisy chain input, so it can be placed between other scanners. And there can be up to 100 individualy adressed displays in the system, but you need additional power extender board to connect more than 10. The unit is just as big as the display itself - 53×26mm. 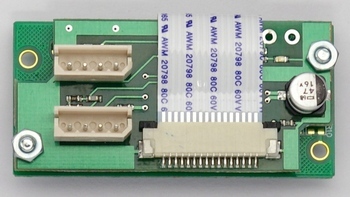 Control electronics is on the back with 2 scanner 4-way connectors, and 2 pads for soldering external switch. Please go to Tutorial section to see how miniLCD interacts with the user during setup procedures. The pictures are about MiDisp, but all messages and way of operation is the same for both. The only difference between miniLCD and MiDisp is their size, and only one backlit color in miniLCD.